There are many species of monkeys. The langur monkey is called ''leaf monkeys'' because they eat chiefly leaves. The large stomach and intestines of these monkeys give them potbellied appearance. They also eat fruit, flowers, grass. The langur monkey has a slender body, with a long tail. Their coat may be red, brown, silver, gray, golden, or black so he can blend in with the places they live in. The adult langur weigh from 11 to 40 pounds. They measure 17 to 31 inches tall, their tail is 21 to 42 inches long. 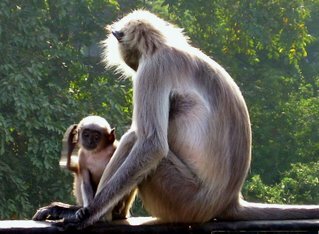 Male langurs are larger then females. The famous Hanuman, the Monkey King ! 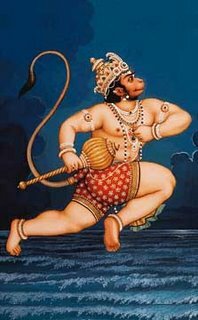 Hanuman is the son of Vayu, the Hindu god of Wind, and is looked upon by Hindus as the ultimate hero. He represents the figure of the ideal being, as he is humble yet brave. His physical prowess, mental discipline and spiritual purity have made him extremely popular all over India. In Hindu symbolism, a monkey signifies the human mind, which is ever restless and never still. Adyaathma Raamaayana is a demystified version of a divine text venerated by innumerable people. Raamaayana is an Ithihaasa [ancient history] so old it is undatable: even the Sanskrit style involves a different grammar I hope people dont demystify The Gods into crude abstractions of Advaita or others. Hanuman is the eleventh manifestation of Rudra Shiva and still Exists as a Chiranjeevi [ Ever Living ] available for perception in his glorious form. Hanuman is one of my primary Guru(s)! He initiated me in a dream into yoga about thirty years ago when He appeared in a divine luminous space and showed me my death and my own subtle body[ sooshma shariram ]which passes on into other worlds after death . He also appeared to me in another dream about eight years ago when he revealed his Vishwaroopaam [Cosmic Form]. Anjaneya Hanuman is divinely ornamented with cosmic jewels and he is luminous golden in colour in my visions. Hanuman is also mentioned in other Puraanaas . It may be noted that Anjaneya is also hailed as the greatest linguist grammarian and musician apart from being the special Guru for martial arts like Kalari payatttu [ from Kerala] Gusthi [Wrestling] etc. Hanuman's Sahasranaama [ thousand names ] are also recited and Lord Sri Rama is The Rishi (Seer) of this revelatory mantram. Of course, Hanuman is the greatest Bhaktha [devotee] .
. 温泉猿 Monkeys sitting in the Hot Springs !
. Dance and Kigo . deals with the fortunes of four fighters - the monk Genjyo Sanzo (Romanized Genjo in the anime and Singapore English manga), the monkey deity Son Goku, the half-demon Sha Gojyo (sometimes spelled Gojou), and the demon Cho Hakkai, who have been dispatched by the Sanbutsushin (The Three Aspects of the Buddha) to India to investigate the reasons behind the recent insanity among the demons. Demons, who have formerly coexisted peacefully with humans in Shangri-La, are going berserk and turning against them. Genjo Sanzo (Genjoo Sanzoo 玄奘三蔵) — Xuan Zang (玄奘) or Tang San Zan (Tang's three scriptures), Buddhist monk who uses a gun which can exterminate demons and a fan to silence Goku and Gojyo when they start to quarrel and can use sutras to defeat stronger demons. 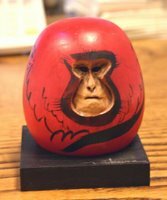 SARU, meaning "to go away, to pass" also a sentence like MA GA SARU　魔が去る, the evil will go away, made the monkey (saru) a special object of bringing good luck in Japan.
. Monkey Amulets and Talismans . Jizo statue of a monkey in Sugamo, Tokyo. The pedestal carving depicts the Three Monkeys covering eyes, ears and mouth. monkey teachers . . . The world's smallest monkey ! 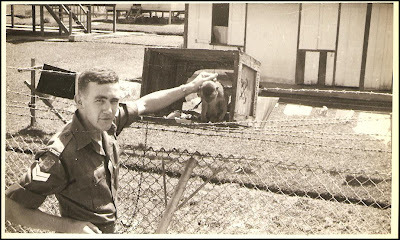 At the Police Married Quarters in Kuching, Sarawak in about 1963. There were monkeys posted all around the perimeter fence as early warning for snakes. This one was called Queenie. The langur monkey, trained since the age of three months, has been patrolling monkey-prone stations on a leash. 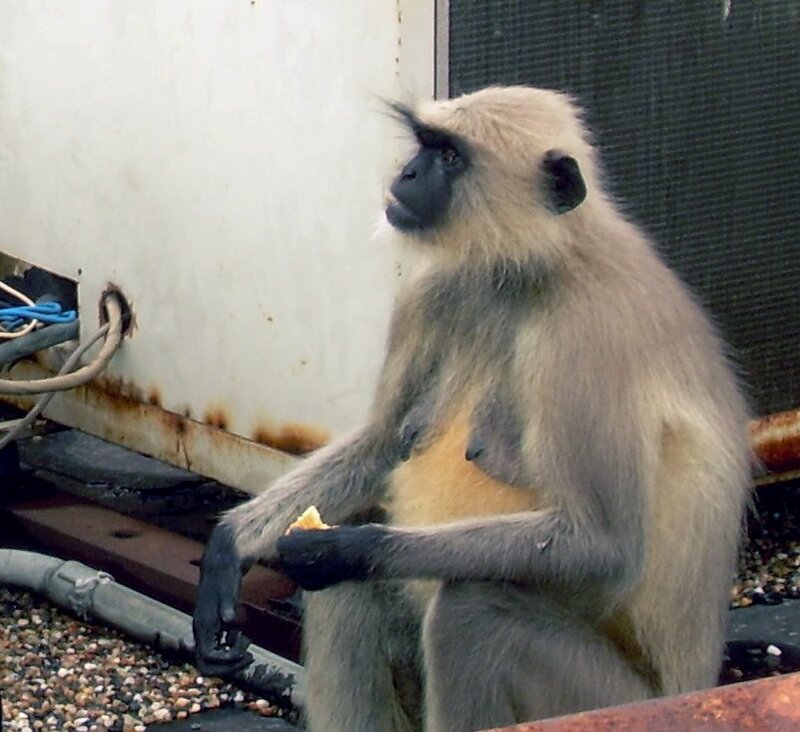 In June, a monkey boarded a train at the underground Chawri Bazaar station and reportedly scared passengers by scowling at them for three stops. It then alighted at Civil Lines station. The Delhi Metro Rail Corporation says it hopes the new hire will avert a repeat of that episode. "It started working about a month ago and since then we've not had a single incident," said Anuj Dayal, a metro spokesman. 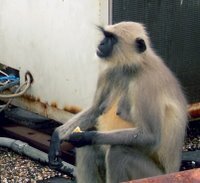 The langur's keeper - or langurwallah - is being paid 6,900 rupees (80 pounds) a month. Langur monkeys are similarly employed around the grounds of parliament and some government buildings in New Delhi. Hanuman on the highway is a familiar sight. There are Hanuman temples (on both sides of the National Highway) most of which remain unvisited by people. Also, there are frequent appearances of monkeys on the highway that disrupt traffic. 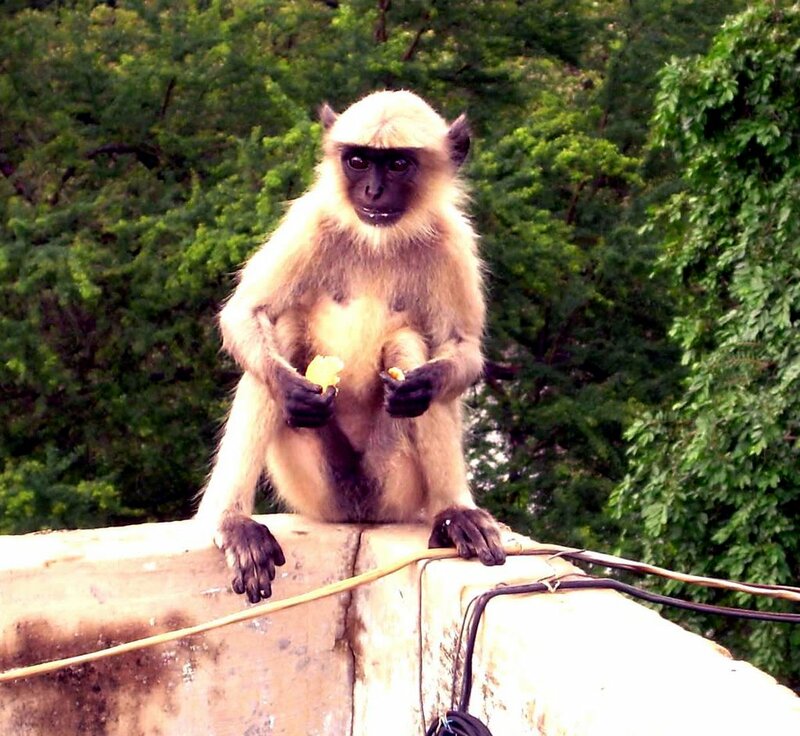 Recently there was a widespread media coverage of monkey-menace in Delhi. They are also in the holy city of Varanasi. Lit. Even monkeys fall from trees! Yeah... when will we stop monkey-"ing" around with haiku? PS... damn that opposing thumb! Victory to thee, O Hanuman, thou art the ocean of knowledge and virtue. Victory to thee O Lord of Monkeys, thou art known in all three worlds. O Emissary of Rama, thou art the home of unparalleled might; Anjaniputra – Anjani’s son, and Pawanasuta – son of the wind god, art thy names. This Hanuman, who possesses ocean-like unfathomable knowledge and virtue, incomparable might and earth-like steadfastness, is known and worshipped primarily as the redeemer in crisis : ‘Ko nahi janat hai jaga mein Kapi Sankata-mochana nama tinharo’ – who knows not in the world, O Monkey-god, redeemer in crisis is thy name. And, the laudation is least exaggerated. In theology or tradition of devotion, no god of any pantheon in India is venerated so much for redeeming in crisis as Hanuman. As occasions of misfortune outnumber those of happiness in life, mankind looks more to him who redeems from misfortune rather than him who bestows happiness. Hanuman, the redeemer, is hence more widely worshipped and has a larger number of shrines dedicated to him than even Rama, his master. Hanuman’s power to redeem is not a mere theological conceptualisation or a believer’s hypothesis, his life, as it reveals in different sources, is its example. In Rama-katha – story of Rama’s life, which is broadly also the story of Hanuman’s life, this emissary and servant of Rama often rises above his master at least in the face of a crisis. It is only Hanuman who wards off adverse influence of planets like Saturn and Rahu, protects from business failures, failure in examinations, politics, sports and other fields. In a strange fusion of the machine and the faith, which reveals when a road-roller, truck, locomotive engine, or a ship, painted with an icon of Hanuman or simply his name, passes across, Hanuman is believed to avert mishap at sea, rail-track and roads, and protect machine and treasures it contains. scriptures abound in tales expounding on his remarkable feats. Read this charming article with wonderful illustrations. 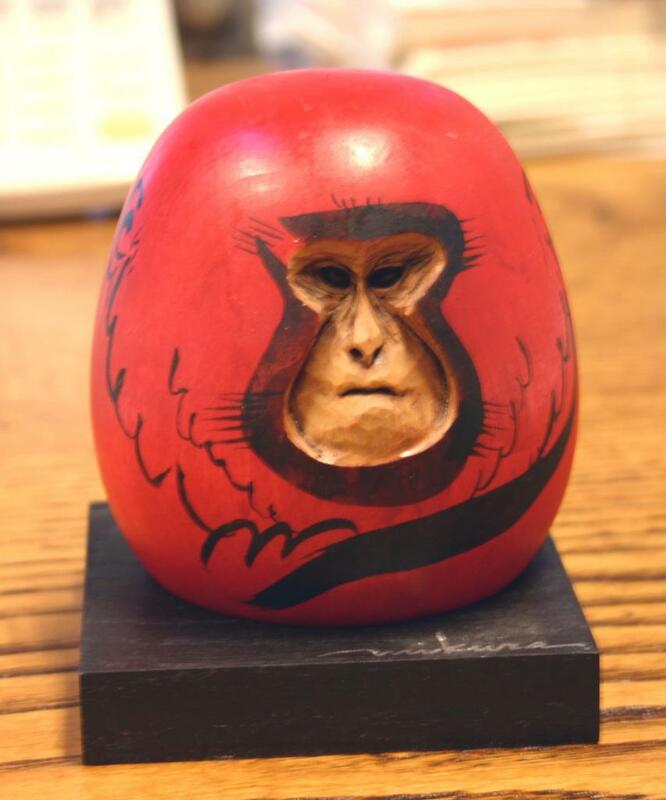 The RED ROUND SUN is our link to Daruma. night I am too tired to do anything."